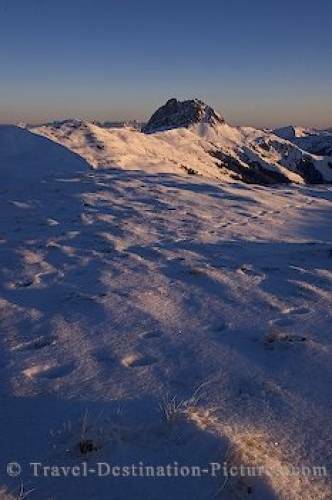 The first rays of sunlight hit the peak of the Rettenstein Mountain in Austria, Europe. When sun comes up during the early hours of a bright clear winter day at the Wildkogel near Neukirchen in Austria the deeply frozen landscape at -20°C gives a great setting for the great Rettenstein in the distance. the Wildkogel in Austria, Europe.